Lindsey Bannish ’11 returned to campus January 3 to describe to students an “invisible disability” she carries with her always: a traumatic brain injury caused by repeated concussions. 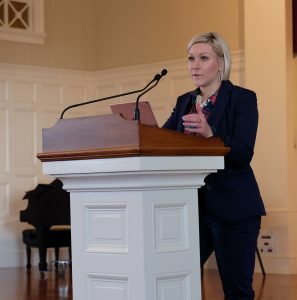 Bannish, a graduate of Mount Holyoke College and a Rehabilitation Counselor Master’s student at Springfield College, advocates for awareness about head injuries. She shared her story with students, outlining the challenges she faced after an injury on the ski slopes that caused one of 10 diagnosed concussions, and how persistent migraines, memory impairment, mood swings, sleep disruption, and impulsiveness temporarily derailed her progress through high school. Previously, she had been a high achiever, always cheerfully taking on new responsibilities. Because of support from her Williston peers and teachers, she made it through after taking a month off of school. But the injury remained, and remains a problem as she moves through her adult life today. Instead of becoming a surgeon, which had been her dream, she will study neuroscience and teach others about the brain. She encouraged students to take the time to recover and to get help if they are injured. “The last thing a high achiever wants to do is admit vulnerability,” she said. However that’s what’s needed to prevent serious consequences. “I wish I didn’t have an invisible disability that I could have prevented,” she said.